The Fonz (Henry Winkler) on Fly Fishing! The Fonz (Henry Winkler) on Fly Fishing! (Video Link Below). From ?Happy Days,? 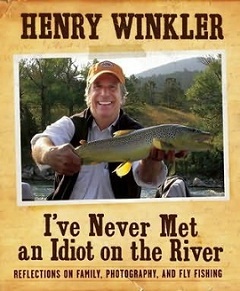 to Great Days for Fishing, from leather jacket to waders, Henry Winkler has written a new book on Fly Fishing. He?s not a newcomer to writing books. He has written children?s books and others. As an actor, producer, director and author his career has been one absent from supermarket tabloid headlines. I awoke this morning to the news that he is much like a lot of us that spend time here at WFN. He?s a Fishaholic. In interviews he has been known to refer to a day on the river as a ?washing machine for the brain,? problems being washed away by the river. As true as that may be, it does sound like a form of rehab. He talks about brown and rainbow trout. His first trip on the Smith River and being hooked, he even describes fly fishing in Zen like terms. In one interview he was asked, what are some of your favorite places to fly fish? His response was, ?Montana. Montana. Tennessee was good, Idaho was very good, Wyoming is good, but Montana is like heaven on earth.? He talks about being banished to his own boat because he fishes his wife?s water. Does this not sound like someone with the addiction we all share? Successful avoiding the tabloid Paparazzi, Henry has written his own latest book, ?I?ve Never Met an Idiot on the River - Reflections of Family, Photography and Fly Fishing,? On the back is a caption ?No fish were harmed in the making of this book. Welcome to the Fishaholic Club, Henry!